Investing in property may seem daunting to some of us, especially if we are doing it for the first time. 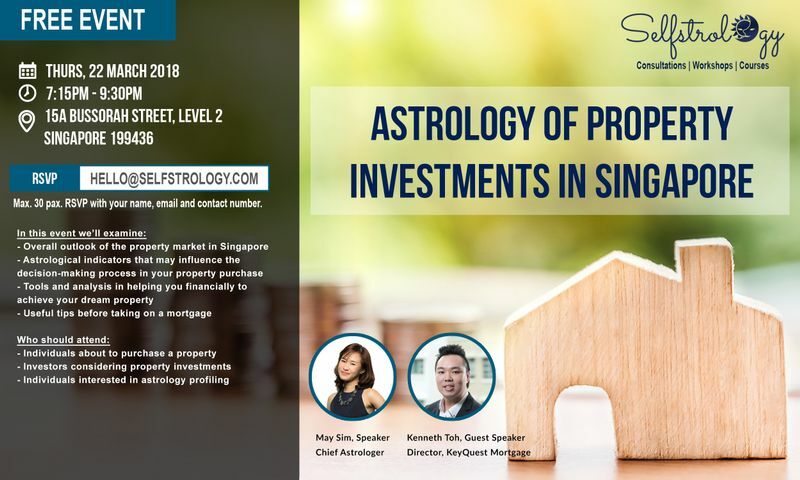 In this event through using astrology, we’ll take a sneak peak of the overall property outlook of Singapore as well as helping you to understand the underlying personal motivations and fears towards buying a property. May Sim is a full-time astrologer who serves as Chief Astrologer at Selfstrology Academy and also sees clients as a consulting astrologer. She is the first Asian graduate with a 3.5-year Diploma in Modern Astrology and also the first Asian lecturer from the International Astrology Academy (IAA). May specialises in Psychological Astrology and has been practicing for 14 years . Since 2013, till date she has seen over 1000+ clients in consultations., including Doctors, Lawyers, Judges, Business Owners, Working Professionals and Married Couples. Kenneth joined Standard Chartered bank in 2010 as an SME banker to help clients secure Business Term Loans on Commercial/Industrial properties. In his desire to serve his clients better, he pursued knowledge and experience in the fields of residential, commercial and industrial properties, becoming a mortgage specialist for individuals and companies. This allowed him to be equally adept in both residential and commercial property markets. After 4 years at the bank, He found there are limitations to helping his clients on their mortgage needs. In order to realise his dream of serving people with the best mortgage products in town, He left the bank in 2014 and founded his own company, Keyquest Mortgage. Keyquest Mortgage allows him the freedom to advise his clients on the products available in the market that best serves their mortgage needs.